State Of The Art Power Pop From Ryan Allen | Pop That Goes Crunch! First impressions of new music are often misleading. The tendency to over-rate, or under-rate, upon an initial listen is ever-present. It has happened hundreds and hundreds of times over the years. 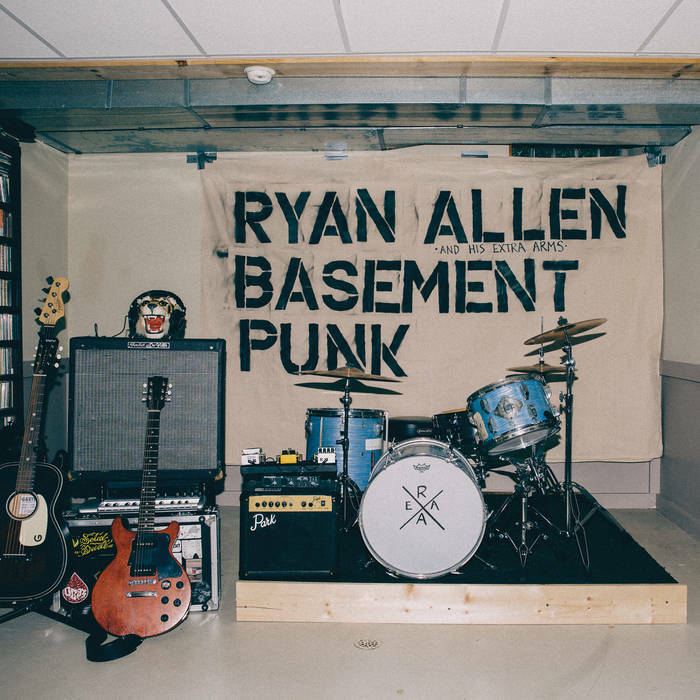 Not so with Basement Punk, the third long-player by Ryan Allen & His Extra Arms. My first reaction was that Allen delivers “one-hit-after-another.” Repeated listens confirms that Allen delivers “one-hit-after-another” — no if’s, and’s or but’s. Basement Punk is an eleven-track, thirty-four minute romp through state-of-the-art Power Pop, with sound checks of old school punk rock, mid-60s pop rock and early-90s fuzz pop. Allen handles all of instrumentation — guitar, bass, drums, keys, percussion and lead and backing vocals — with expert execution. Mixing and mastering by the inimitable Andy Reed ensures that Basement Punk hits all the right sonic spots, particularly when played as loud as the material demands. The hits they keep-a coming. “Basement Punks” is a spirited paean to the DIY-spirit. The sweet nostalgia of “Mal & Ange” picks up sonically and lyrically where “Alex Whiz” left off, except from the opposite perspective. “Gimmie Some More” is a straight-up rocker that stays decidedly outside the middle-of-the-road. Allen ups the tempo nicely on a punkier pair — “Two Steps Behind” and “Without A Doubt.” Two mid-tempo tracks, however, round out Basement Punk with aplomb and grace. “People Factory” spikes mindless conformity with an unforgettable melody ripped from 1965. The closer, “Everything In Moderation” provides words (perhaps) by which to live after laying down a perfect initial riff you swear you’ve heard before, but you haven’t. That pretty much sums up Basement Punk, a work of great originality steeped in familiar rock ‘n’ roll traditions. If it has any flaws, I have yet to hear them, and it easily will find a slot in my year-end Top 10. Get it right here, digitally, beginning September 30, on or disk from the fine folks at Kool Kat Musik. And speaking of disks, we will be giving some away, real soon. Watch this space for more details. Pingback: We’re Giving Away Three Copies Of Ryan Allen’s New CD!! | Pop That Goes Crunch!